Station Eleven and why I’m not on board. 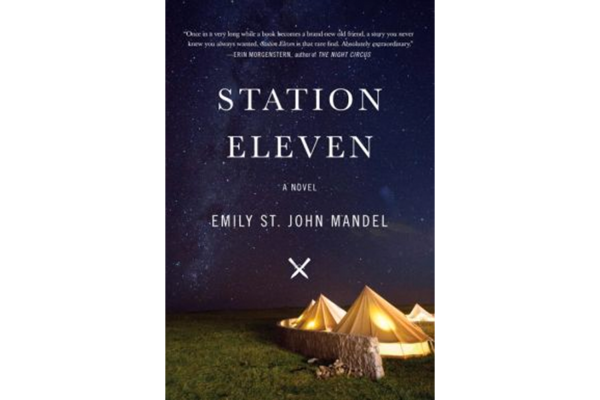 Emily St. John Mandel’s Station Eleven is gaining widespread acclaim. It is a New York Time’s bestseller, and was a 2014 National Book Award finalist. For the life of me, I cannot understand way. While personally, 2014 wasn’t a stellar year for reads, this was by far the biggest disappointment. To by far to Mandel, part of the disappointment can be can be laid at the feet of Random House. I was sent an e-mail by the publisher telling me of an exciting new book that told the tale of a troop of actors in a post-apocalyptic world struggling to keep culture alive by putting on plays by Shakespeare. The group was determined to bring light to another wise darkened world. Shakespeare, post-apocalyptic lit? My heart skipped a beat; why didn’t I think of this? My two favorite types of lit in on book. With a little envy for Mandel’s idea, yet excited to see how this would play out I pre-ordered the book. I could hardly wait to read it. This had to be good, right? Post-apocalyptic literature, as you know, concentrates on survival. The struggle to survive, and what it means to survive is usually played out with characters coming face to face with situations they otherwise would never encounter. Authors push their characters into the darkness in order to see just how far someone can go and still retain their humanity. Robert Kirkman’s The Walking Dead is a good example of this. I cannot think of any post-apocalyptic book that shows the struggle to retain culture. The idea that survival depends on keeping culture alive is novel, yet very much needed. What is the purpose of rebuilding civilization if culture is dead? This question was one that was promised to be answered within the pages of Station Eleven. As it turned out, the promise was broken. The plot is very convoluted, so bear with me as I try to unravel it. The story starts a few hours before the pandemic that will end up wiping out most of humanity hits New York. Famed actor Arthur Leander is on stage as Lear when he suffers a major heart attack and dies. A medic named Jeevan who is in the audience tries to save him. A child named Kirsten Raymonde is on stage when Arthur dies. She is very fond of Arthur who had just hours before had given her two comic books from a series titled Station Eleven. The comic tells the tale of a group of post-apocalyptic survivors traveling through space. Some of the survivors want to return to earth and see if humanity has survived, while others want to find a new planet in order to start fresh. The first part of the book centers on Jeevan and his struggle to understand the horrors of a worldwide pandemic. It is compelling reading but unrelated to the central plot. Once his story is told, the book then jumps 15 years after the fall of civilization. It is here we meet our troop of “actors”, Kirsten Raymond is one of them. Instead of meeting a group of people who have retained a civilized or cultured way of life, we are introduced to characters who seem to be suffering from post traumatic syndrome, which is odd given that Mandel tells us most are too young to remember life before the apocalypse or were born after the fall. The actors use the excuse of traveling in order to avoid settling somewhere. All the communities they encounter are dangerous or are wary of strangers. After a run in with one particularly cult- like community, Kirsten and a companion become separated from the troop and set out to find the fabled Severn City. This city turns out to be an airport full of survivors and their offspring. It is here where past and present collide. This is also the best part of the book. I would have been singing Mandel’s praises if she had written an entire book about these “airport” characters. One of my biggest complaints is a problem that is shared with other post-apocalyptic novels. Why, if so many people survived, can no one figure out how to get the electricity back on? In this novel all the engineers, mechanics, and homegrown preppers must have died because no one has a clue how to do anything! Boy scouts know how to make batteries out of potatoes, yet there’s not a boy scout among the hundreds of survivors. Everyone we meet acts as if they’ve always lived in a third world country. As I read the book, I could not help but think that Mandel was trying to tell too many stories for one book. The novel jumps back and forth in time. A large portion of the book tells of the decline of Arthur’s marriage to his second wife Miranda, the author of Station Eleven. Like Jeevan’s story, this had little to do with the plot and took a lot away from it. Mandel would have been better off, using these pages to make good on the promise of bringing light into a darkened world. This is a novel about memories and how we hold on to them when our world is falling apart. This is the strength of the book and should have been the focus. It is when Mandel is writing about memories and what they mean to us that the book becomes alive. But sadly, because she offers so many characters and such a long time span, even this becomes stale. I am sure Mandel has a message but it was lost in all of her backstories. It’s hard to take a book about memories serious, if those we are supposed to remember won’t go away. The novel ends so abruptly one has to wonder if there is a sequel coming or if Mandel became tired of writing. It was as if she realized in the last chapter she had nowhere to go with this story. I felt cheated. As much as I liked bits and pieces of the book, taken as a whole it just fell flat. It was a collection of short stories rather than one cohesive story. For the life of me, I cannot figure out why this is the book everyone is talking about. I am hopping one of you has read it, and can give me a good reason as to why it is so highly praised. Hamlet sums up my feelings best. So sorry my friend. Should have noted that I was talking about fiction reads. Your science book was the best of my 2014 reads. I have to tell you, the premise of the book didn’t really appeal to me before reading your review, but even if it had, that first 15 year jumped would have most likely pissed me off and made me quit any way. I’m impressed that you finished the read, honestly. There’s no way I could have made it through something as jumpy as this book seems to be. If someone ever gifts it to me, I might give it a go, but I’ll probably not be one of the people talking about this book any time soon. It was an easy read. I got through it in one day. Though to be honest, there was a time about half way thru when I started to wonder why I was still reading. The time jump didn’t bother me, I’ve read several books that use this plot device. What bothered me was the waste of storytelling. I’m not sure I got the purpose of watching a failed marraige. The writing was impressive, the story, not so much. Well, then let’s hope the author does better next time. Do you think you’ll give her another go? As I read your review I rather anticipated your closing comments about this being set up for a sequel. Such a shame it doesn’t live up to its initial promise. I would argue that ‘culture’ matters as much as survival after any ‘apocalypse’ if we are to retain our humanity. Here in the UK we’re still suffering more cuts to services and wage imbalance as a result of the 2008 ‘apocalypse’ (aka the banking crisis followed by a long-lasting recession). Why are libraries, theatres, leisure centres and the like closing? What do people do when times are hard but tell stories and recount myths? These sustain their spirits as much as food and shelter sustain their bodies. I try very hard not to give too much away as I might have readers who intend to read the book anyway. No way would I want to spoil the ending. Couldn’t talk about a possible sequel without giving things away. All I can say is Mandel wrapped up one story arch, while leaving all the others hanging. The end felt like the end of chapter, not a novel. I completely agree with your argument, which is why I had such high hopes for this book. What good is survival if we don’t retain our art and culture? And it’s not just our myths that we need to remember. Libraries contain our knowledge. Without knowledge we recede into the darkness of ignorance. Look what happened in the “Dark Ages”, when knowledge was lost for centuries. Mankind crawled back into Plato’s cave, and it took a very long time before we dared crawl back out. We will always need our libraries etc if we want to continue to move forward. I do have a strong bias here, because I dislike most books with a non-linear narrative. But I think what bothered me most about “Station Eleven” is that there is much too little in there about the characters I really care about, Clarke and Jeevan. Also, after the 15 year jump into the future there is almost no trace of suspense, the threat from the “Prophet” and his disciples is too weak to really keep one up at night. Mrs. Mandel has enormous has enormous talent, though. I hope she will one day write better plots. I completely agree! The whole Prophet subplot was a real let down; it could have been so much better but it is as if Mandel had no idea where to go with it.